Golf is like no other sport in the world. Where else can you get to take to the field of dreams in the cradle of the sport (to mix my metaphors)? 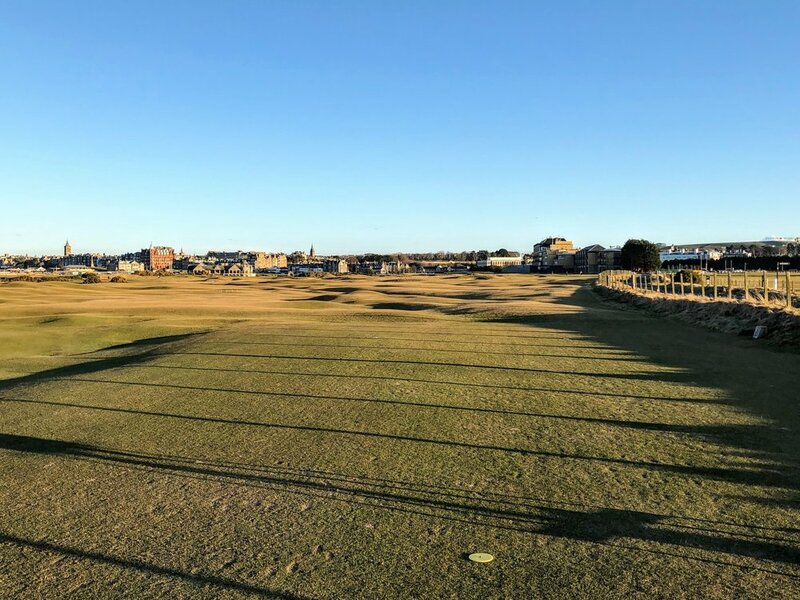 Playing at St Andrews is like turning out at Wembley, or knocking up on Centre Court - but unlike those experiences it is achievable to every golfer who has the will and money to do so. I have played the Old Course several times now and it is a magical experience. It is not technically the best golf course in the world but the all round experience cannot be matched. I've detailed below how to play the course and there are plenty of different options.This is no Augusta or Pine Valley. If you set your mind to it with a little preparation it is pretty easy to get it sorted. If you do play make sure you give yourself plenty of time before the round to take in the atmosphere and have a few putts on the Himalayas. Don't expect to find a club full of history a la Muirfield or Royal St George's when you check in at the Old Course. The main visitors' clubhouse is a modern affair which is fairly clinical in getting players registered and despatched to the first tee. The views from the restaurant area are great though and help to build the anticipation. The starter's hut itself is far more 'authentic' as an experience. This is where you need to show your handicap certificate to get on. Actually, they have only once checked mine and one of the group that day didn't have theirs with them but they got waved on anyway. That's not to say the course isn't well marshalled. Out on the course rangers will be keeping a watchful eye on you and asking you to keep up with the group in front if lagging behind. They have always been a friendly bunch to us but then again have never had to ask us to move on! Don't feel embarrassed about asking the starter to take a picture of you on the first tee. They are well used to it and I don't think that a selfie on the first tee would quite do it justice! Do take in the atmosphere, it truly is something unique in golf. There will likely be some tourists around watching you, the starter will announce you over the tannoy and then take a deep breath (you, not the starter). It is one of the widest fairways in golf but that doesn't mean the nerves will in any way subside. I used to play with something of a strong fade and that brought thoughts of the right hand side out of bounds to mind in my first outing. By the time of my next round a few years later I had moved on to a pronounced draw (let's not say more that that) which brought the left hand OOB into play to my frazzled mind - indeed I hit it periously close to there as a result. It's not the hardest hole though (I got a rare birdie the first time I played it) and to open with such an iconic hole sets you up really nicely for what is to come. The course is open and very fair. As has been well documented many times, if you have a tendency to the left you will be well served and stay out of most of the trouble. The greens are simply huge - I had an 80 yard putt on one of them. The first time I played here one of my playing partners, who plays off 3, had a 74 with 40 putts (OK, including 2 from just off the green) because he just couldn't miss the massive greens. This playability helps make it such a fun round for everyone and pace of play has always been pretty good. There's not much point me trying to give you a hole by hole account though as the odds are you will know them already. When I was a kid I used to go to the Open when it was on the Old Course, and every October the Alfred Dunhill Cup, so had followed many of my heroes around the links. To find myself announced on the first tee, hit a tee shot at 17 and walk over the Swilken Bridge on 18 are all pretty amazing experiences which anyone can get. I urge you to get a tee time! Ahead of the 144th Open at St Andrews, we count down the most memorable moments witnessed at the Home of Golf. Documentary filmmaker Erik Anders Lang takes viewers on a tour around the globe searching for the craziest, most intriguing stories in golf. In the first episode, Erik visits Scotland and the home of golf, the Old Course at St. Andrews. It will amaze many, but with a bit of planning and a bit of luck playing St Andrews is actually very easy. You just need to be organised. Around the end of August every year the St Andrews Links Trust opens for applications to play the Old Course in the subsequent year. You have a two week window to fill in a form on the website. A few weeks later you'll hear back if you have been successful. Simple as that. It used to be 'first come first served' and I never missed out once in 3 times. Now it's gone to a ballot based on the submissions for any date which is probably fairer but rewards the quick off the mark less! Obviously, your odds will be increased by trying to get a time outside the peak summer months. If you are looking for a time to book through this method between mid April and Mid October you need to book two courses - £330 all in. That is no great hardship if you are staying in the area as the Jubilee or New course would be well worth playing. Outside of the summer you can play just one course. There are two other main ways to play. You can enter the ballot 2 days before and see if you are lucky enough to get a time, or if you are a single player turn up on the first tee and wait - if you are there early enough in the day you will almost certainly get on. These are cheaper options at £180 a round (cheaper out of the peak season) but obviously a more risky route. St Andrews are always introducing new ways to get on the Old Course at a cost and there are new uber high end packages coming as well as more reasonable winter deals which are on the site. The website is very good when it comes to info on how to get on so do have a look here and your dreams can come true!